Our short showers and drizzle aren’t going away. But the dayslong drenchings that sometimes soak the city? They’ve been happening more, according to a Seattle Public Utilities study. 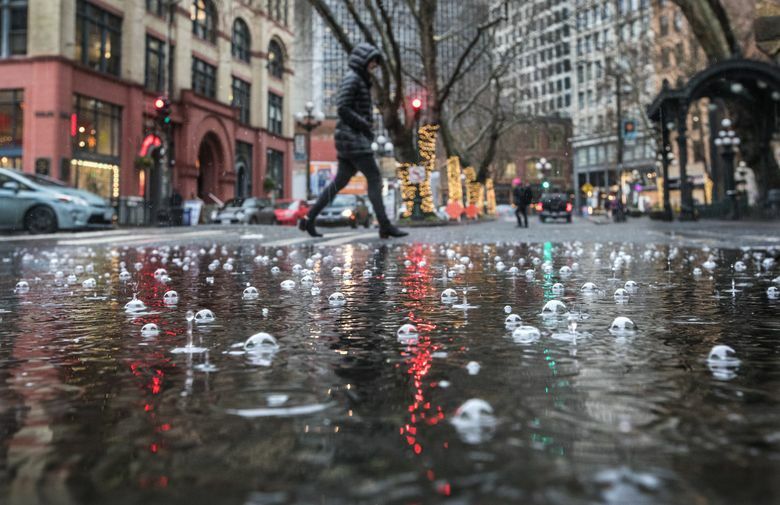 Attention, Seattle residents: Have you noticed more steady, long-lasting rainstorms in a city better known for gray skies, short showers and drizzle? Turns out you’re on to something. 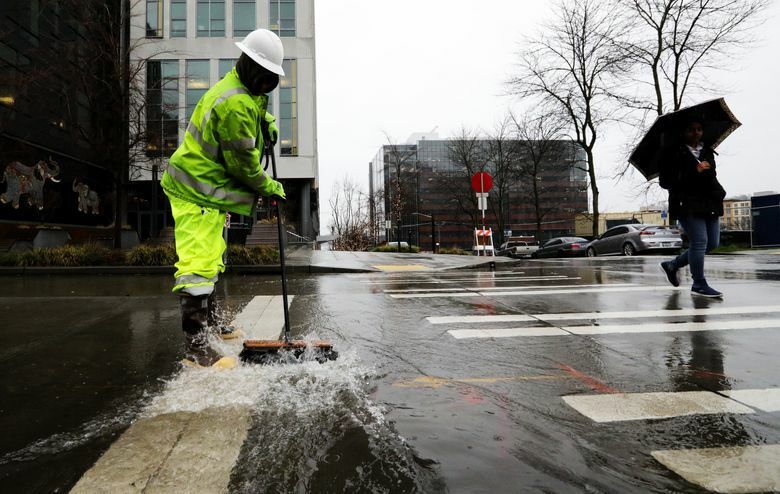 Over the last 15 years, the city’s had more extreme rain, according to a new study by Seattle Public Utilities (SPU) officials, who say the weather is a climate-change preview. SPU has been measuring rainfall for about four decades with gauges in 17 locations across the city, such as Magnuson Park, the Maple Leaf Reservoir, Fauntleroy Ferry Dock and Aki Kurose Middle School. The information from the gauges helps SPU plan and design drainage and sewage projects, Rufo-Hill said. The last major rainfall study was in 2003, so SPU had some catching up to do. The sprinklings most common in Seattle aren’t going away, according to Rufo-Hill. And the city’s rare flash storms aren’t necessarily worsening. Seattle has a longer-than-average rainy season, but is only 44th nationally in total accumulation, less than such cities as Atlanta, Houston and New York. That’s partly because our typical rain comes from low, layered clouds rather than high, dense clouds. And that may be a reason why many of us are umbrella-averse. “Most of the rain we get hasn’t changed,” Rufo-Hill said. But according to the SPU study released in December, “extreme” rainstorms have become more common — and more extreme. What exactly does that mean? SPU measures storms by how long they last and how much rain they dump, and then categorizes those storms based on how often they can be expected to occur. What used to be considered a once-in-a-century storm for a 24-hour period — 4 inches — can now be expected once every 25 years, according to Rufo-Hill. The new standard for a once-in-a-century storm for a 24-hour period is more than 5 inches. Another example based on the addition of 15 years of data: What used to be a once-in-a-century storm for a 6-hour period — 1.86 inches — can now be expected every 25 years, according to SPU’s modeling. “Our definitions of extreme and normal have changed,” Rufo-Hill said. Here’s something confusing: Seattle has been hit with at least 4 inches of rain in 24 hours several times since SPU started keeping track — in 1981, 1986, 2003, 2007 and 2010. That’s a lot more than once every 25 years. What gives? SPU’s projections take the superlong view rather than concentrating only on what’s happened since its gauges were installed in 1977, Rufo-Hill said. “We’re doing the best we can with the sample size we have,” he said. The science is complicated, but some long-timers say it sure seems like the change has been easy to see. “I used to be able to pedal my bike and stay dry with the evaporation,” said John Dunlap, who moved to Seattle about 40 years ago. Terrie Botts, a retired engineer, isn’t the type of person to trust her instincts. She likes evidence. But the lifelong area resident also has wondered whether the skies are dumping more rain on her town. Not that she minds. But Mayorquin, who grew up in Seattle, sees a silver lining amid the city’s recent population explosion. “Hopefully it’ll stop people from moving here,” he quipped. Not likely, with a record number of apartment buildings under construction. Down the block in booming South Lake Union, Jesse Peck was working on one of them, grateful for a break in the rain. Downpours make construction work harder and wetter, said the electrician, who lives in Sultan. The new measurements matter — and not only because they interest amateur weather watchers like Laskin, Rufo-Hill said. SPU will use the information to help make decisions about projects that prevent flooding and protect the environment. In parts of the city with pipes that receive both sewage from buildings and stormwater from streets, rainstorms can overwhelm the system and send a nasty mixture spewing into local waterways. To comply with a 2013 consent decree, SPU is building an enormous storage tunnel under the Lake Washington Ship Canal. The tunnel will keep nearly 60 million gallons of polluted water out of the canal each year. That effort is already on its way, but future projects will benefit from the new rainfall data, Rufo-Hill said. “When we’re putting a pipe in the ground, we’ll use this data in combination with other information to determine exactly how much larger it should be,” the SPU scientist said. The rainfall information also is important because scientists like Rufo-Hill think climate change will ensure that extreme rainstorms continue. “We may have just gone through a period of variability. But the best-available science suggests” there will be change over the long term, he said. Mayor Jenny Durkan mentioned the increase in rain this week while touting steps she contends the city must take to combat climate change, such as installing electric-vehicle charging stations and solar panels. “Cities don’t have the luxury of climate denial and cannot wait for federal leaders to embrace science. The effect of inaction is already at our doorstep,” Durkan said in a statement. SPU’s study, Rufo-Hill said, jibes with local rainfall data collected by the National Weather Service. And Logan Johnson, meteorologist-in-charge at the service’s Seattle weather-forecast office, brought up another reason to pay attention. “This study underscores the need to better prepare for flooding, not only in Seattle, but throughout Western Washington,” Johnson said.